Front loading commercial dumpsters are an affordable and convenient way for any business to manage waste production. They come in a variety of sizes with the most common being the 2 cubic yard, 4 cubic yard, 6 cubic yard, and 8 cubic yard closed top variety. 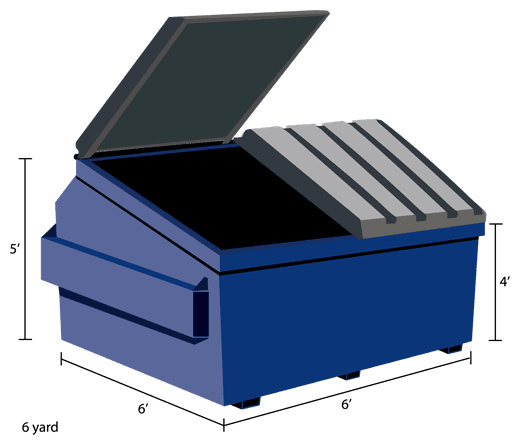 The are ideal for permanent waste management and are very flexible and can placed easily outside any type of business from a small restaurant to a large apartment complex. Call 1-803-573-0003 For Your Quote! 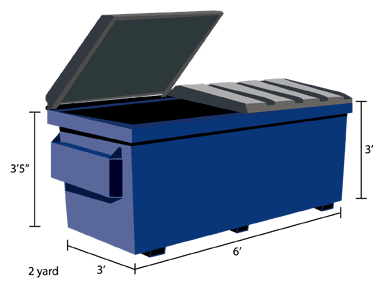 Unlike the larger roll off dumpsters, the commercial front loaders are fitted with a lid and are filled from either the top or the sides. This provides a clean and odor-free environment to protect your business. They perfect for long-term commercial disposal usage. Collection can vary from daily to monthly pick up depending on the amount of waste generated. Regardless of the type of business you operate waste management is a consideration that is often overlooked. At Bargain Dumpster, we offer many different options and have experienced representatives that can help you find the right fit. Take a look at the most common sizes below and give us a call at (803) 573-0003, we will be able to handle all your waste disposal needs. 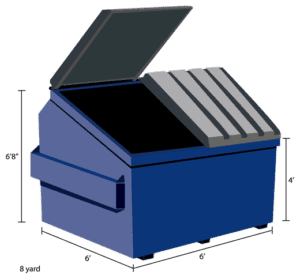 2 Yard Dumpsters hold approximately 12 large trash bags, or 24 regular trash bags. They are great for small retailers, general trash, small restaurants or any business that generates a small amount of waste. If the 2 yard dumpster isn't quite big enough take a look at our 4 yard dumpster. It will hold approximately 24 large bags of trash or 48 regular trash bags. 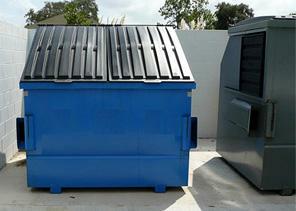 The 4 yard dumpster is the perfect choice for small office buildings, churches or service stations. The 6 yard commercial dumpster is a very popular size. It can accommodate approximately 36 large trash bags, or 72 regular bags of trash. They are commonly used for larger restaurants, retail, hotels, and strip malls. If your waste stream is little larger the 6 yard dumpster may be the perfect choice. The 8 yard dumpster is our largest commercial front loader dumpster. It can hold about 48 large trash bags or 96 regular bags of trash. They are a great choice for apartment complexes, large distribution centers, healthcare facilities, malls and shopping centers, grocery stores, and cardboard recycling. 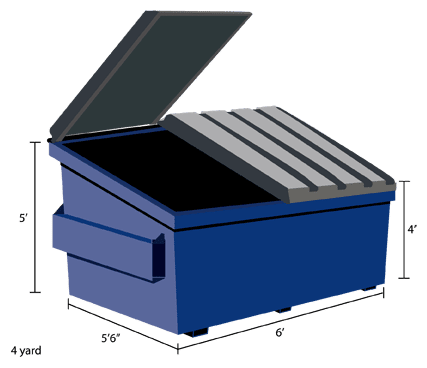 If your waste production is on the larger side our 8 yard dumpster is the perfect choice. Please note: dumpster styles represented here are approximate and can vary slightly depending on the manufacturer. Know exactly what you need? Or do you have more questions? We are here to help! Call us at 1-803-573-0003 to request a commercial dumpster service quote today.